Lighten up. It’s the “Light and Color” episode. Without light, we wouldn’t be able to see. It would be like living in a room with no windows, doors, or lamps. There’s an old saying, “We don’t see things; we see light bouncing off of things.” We see things, and colors, when light bounces off things and into our eyes. White light, like the light from the Sun, is made up of all the different colors of light blended together. When white light hits something white, almost all of the light bounces into our eyes, and we see the color white. Things are different colors because some light bounces off and other light gets absorbed. An orange is orange because it absorbs all different colors of light except orange light. Grass is green because it absorbs all different colors of light except green light. 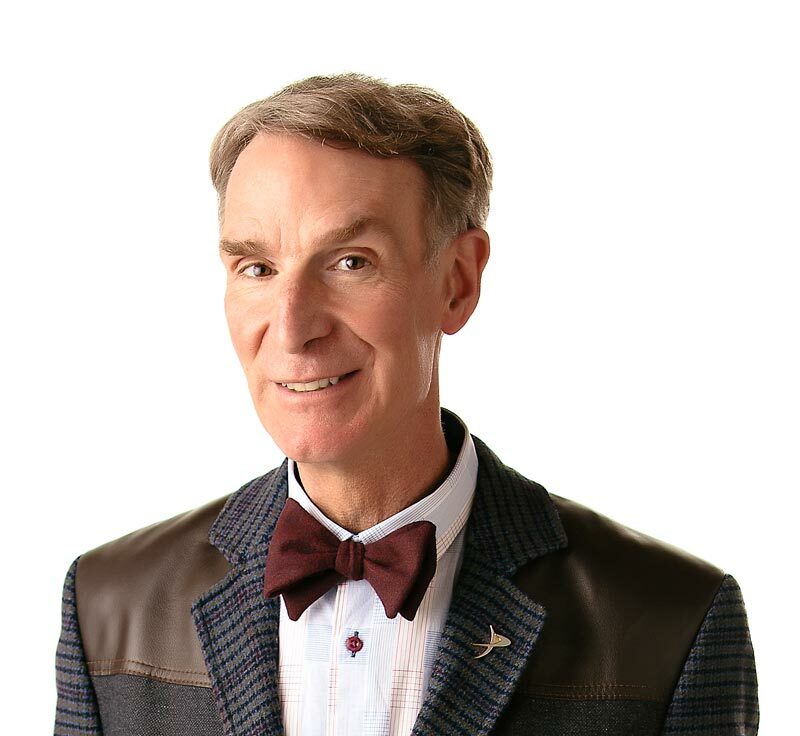 Bill Nye’s lab coat is blue because it absorbs all different colors of light except blue light. All colors, including black, are made in the same way. It’s just a matter of reflecting or absorbing light. Science will “color” your world with Bill Nye the Science Guy. White light is made up of all the colors of light mixed together. The color of an object comes from the color of light it reflects; the other colors of light are absorbed by the object. Light moves in a vacuum at 299,728 kilometers (186,282 miles) per second? Dogs and cats can’t see colors? The name ROY G. BIV stands for the colors you see in a rainbow – red, orange, yellow, green, blue, indigo, and violet? “Light and Color” by Alan Ward. Published by Franklin Watts, 1992. “Color and Light” by Barbara Taylor. Published by Franklin Watts, 1990. “Light” by Kim Taylor. Published by John Wiley and Sons, Incorporated, 1992.